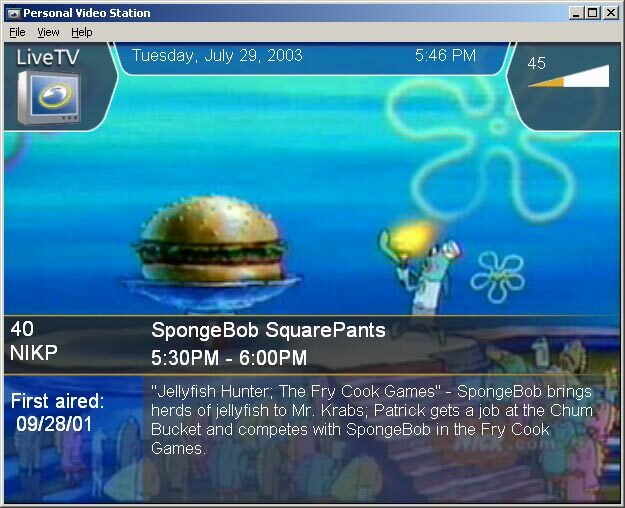 SnapStream's Personal Video Station is an ambitious product, aiming to be a PVR software package that works with any windows PC sporting an approved video card. With many new PCs shipping with built-in TV cards and homes being outfitted with cable in every room, all you need to add is the $79 (currently selling at $59) software package to have your own personal recorder on your PC. The first TV tuner card I ever had was an ATI all-in-wonder I got in early 2000 and I remember playing with the earliest versions of SnapStream back then (which didn't really work, but then my video card barely worked). About a month ago, the folks at SnapStream asked me if I'd like a review copy of their software to check out, so I looked at their site it appeared that the product had really matured. I agreed and have been playing with the package for the past few weeks, taping dozens of shows in the background while I work. I got a package with a Hauppauge WinTV PCI analog TV tuner card and the SnapStream 3.0 software (now up to 3.2), and the install went smoothly. I got the latest drivers from the Hauppauge site and it worked perfectly under XP. Next I installed the SnapStream package and that also went painlessly. After rebooting, I tried out some live TV watching but had sound card problems. I had a $10 PCI sound card that acted erratically, sometimes sending feedback out, and after troubleshooting with the drivers to no avail, I replaced it with a $29 Creative Soundblaster card that worked flawlessly. 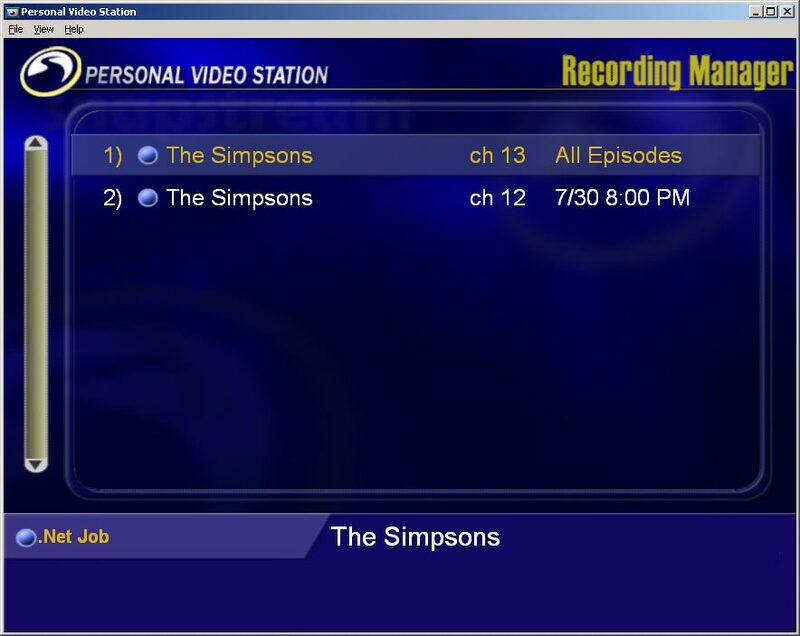 SnapStream's software lets you view TV in three modes, either in a window, full screen, or through a local web browser (the local web browser is used primarily for navigating your recordings, not live tv). 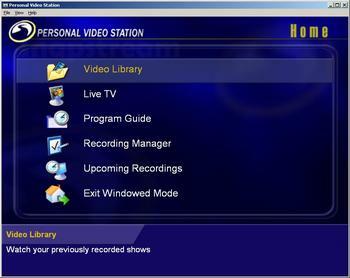 The window and full screen modes are very TiVo-like, and only differ in the size of the window. I didn't have a remote control with my TV card, so I had to use keyboard commands to navigate once the TV viewing was launched. It seemed a bit odd that mouse input wasn't allowed, and from time to time I had to look up the keystroke command to pause or change the volume. Channel surfing was quick and the overlay offered a lot of extra info about a program, including an original air date (I can't even get that info on my TiVo). Pausing live TV worked as promised and hitting record while watching live TV didn't drag my PC's system down nor did it result in any noticeable rise in processor temp (after almost melting a motherboard I pay attention to these things now). I could easily minimize a show being recorded and work on my PC normally. Overall, the interface was straightforward and looked amazing (the screenshots don't really do it justice). This is the first welcome screen when it starts, and resembles TiVo Central a great deal, letting you jump to the other features. 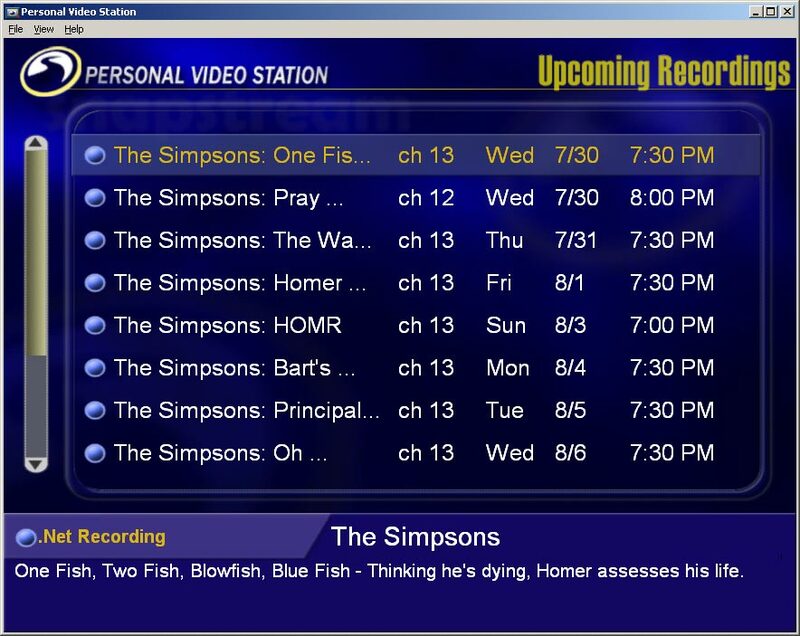 This screen is the equivalent of the Now Showing screen, listing the previously recording programs ready to watch. 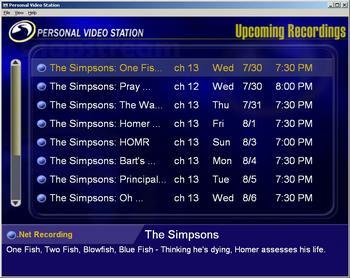 The screen above shows a season pass screen set with a couple shows. This is a list of upcoming episodes and I have to say it was easier and faster to work with data like this with SnapStream, than a TiVo. Granted, my PC is sporting a multi-Ghz processor, but it was nice to see a snappy interface that responded to commands instantly. 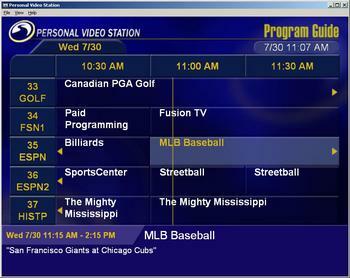 The program grid was easy to surf through and easy to access, though you had to exit live TV to use it. 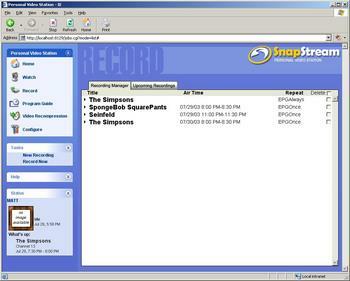 My favorite feature in Snapstream's software was the outside scheduling service available at SnapStream.net. 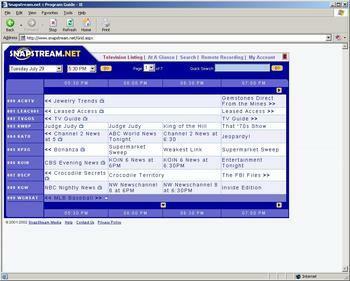 While TiVo has a similar feature in the Home Media Option, the functionality at SnapStream.net was much more impressive. 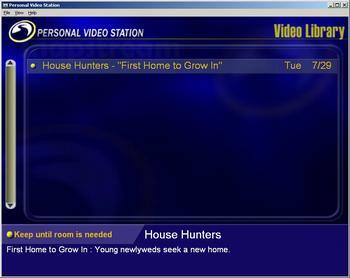 After selecting a lineup, I could do searches across the grid for keywords and easily record single episodes or grab new season passes in a single click on an icon. The part that amazed me was that my desktop's SnapStream program would pick up my internet recordings in just a minute or two after I set them. I used SnapStream.net to set most all of my season passes thanks to the search engine there. SnapStream offers a bevy of additonal features I didn't get the chance to try out. Apparently SnapStream.net also has a WAP version, so I could set, search, and record shows on my PC from my phone. It also offered the chance to stream recorded shows to other computers on your network, though I couldn't get it to work in Windows Media Player for one of my other macs on the network. One other crazy niche feature was the ability to stream your recordings to a PDA like an iPaq on your home network, complete with a scheduled service to compact your recordings down especially for the PDA. I don't really know anyone that watches video on their PDA, but I'm sure they would find this a killer feature. SnapStream records by default in MPEG2, which looked ok but was a tad bloated when storing shows. Hour long shows ran about a gig in size, similar to a TiVo. I experimented with different codecs and settings and eventually settled upon Windows Media Video's "Near-DVD" quality that looked fantastic but was half the size of MPEG2 recordings. 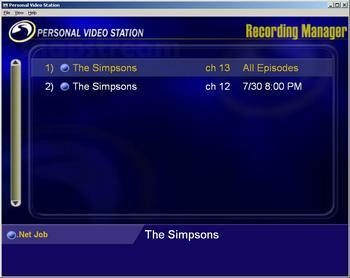 The nice thing about SnapStream was also that after you recorded a show, it was a movie file on your PC's hard drive. You could make a DVD of your favorite show's season, you could transfer it to other computers for watching later, or you could even stream it across your network to outside viewers (watch a show at work, streamed from your home PC) though most home networks aren't that fast. After watching TiVo and ReplayTV cave to Hollywood's unrealistic demands, it's nice to see a software package that lets users freely do whatever they want with content and doesn't block legitimate and fair uses. Of course, my biggest problem was figuring out how to watch TV on my desktop PC for extended periods of time, but this problem is shared with any PVR software that runs on a PC. Normal PC operation puts me about 2 feet from my monitor, while normal TV watching puts a screen over 10 feet away, so when watching hour-long programs, I would usually run the show full-screen and roll back in my office to a comfortable distance to watch. The only area for improvement I found was that I had trouble with the local webserver interface on my powerbooks. The web interface mimics a XP file explorer window perfectly, but uses Windows/IE specific tricks to launch movies and switch between window views. I tried viewing the local server in IE, Mozilla, Safari, and Opera on my mac but none could even display the index page correctly. It would have been nice if they coded the page to basic web standards, so any browser and any other device could play along. Overall, I was very impressed with the package. 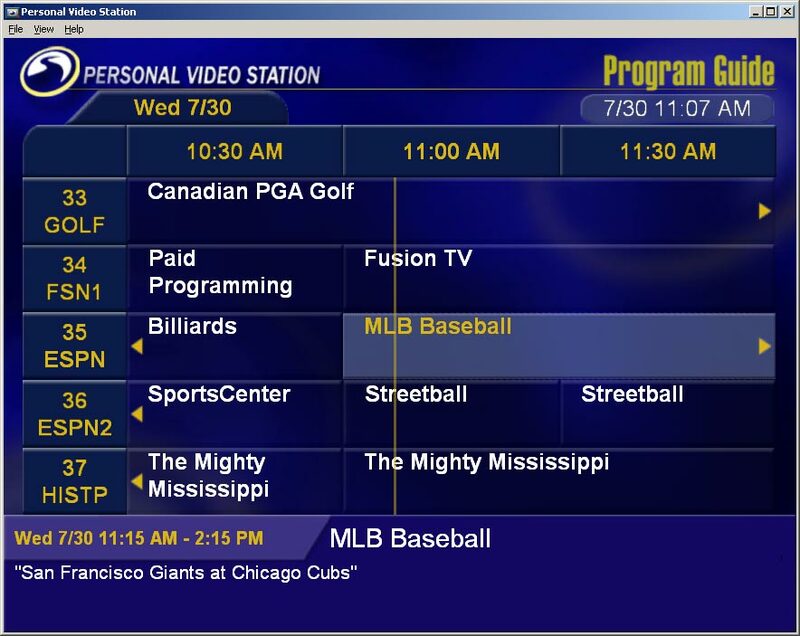 For $59, with no monthly service fees ever, the software is a bargain compared to offerings like TiVo. I've been thinking about building a home theater PC, and I wasn't sure if I'd run MythTV or try and get a copy of Windows Media Center running, but for a fraction of the work and/or price, this package does everything TV-related that I'd need. 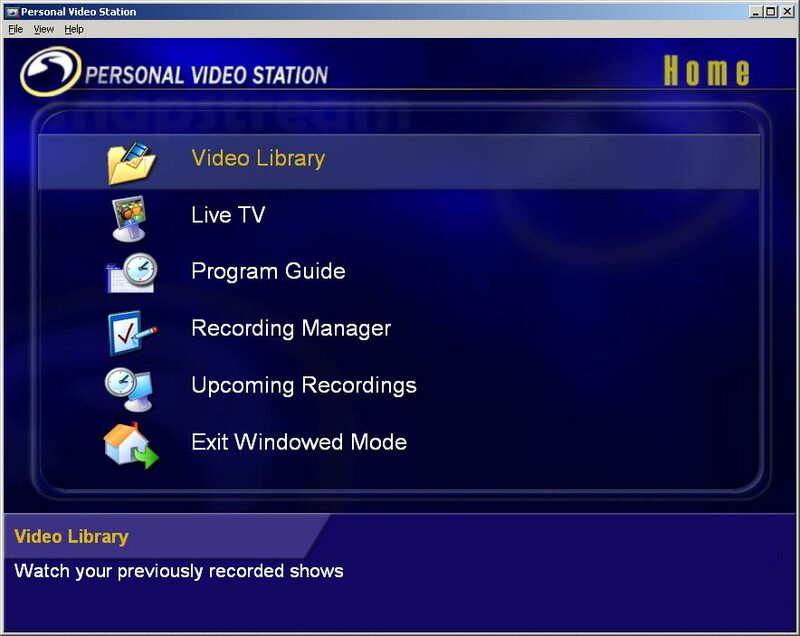 You could probably build a barebones PC system with the TV card, a remote, and S-video out to a television for about $300 and use the software to manage all your TV recording and storage. Would I trade a TiVo for a small PC running Snapstream? After playing with it for a few weeks, I'd have to say it is certainly possible. A home theater PC can do more than a TiVo (play videos, any audio format, photos, show the web on your TV, etc), and this package certainly covers the TV recording features that TiVo pioneered. If my reviews carried ratings, SnapStream's software would get nearly a 100% score for the low cost, loads of features, and easy video sharing, with the non-PC platform sharing being my only criticism.